Gee but that's beautiful! Thanks for sharing. I always love reading this, even better if I get to hear Ms. Angelou say the words herself. Thank you. You know she has passed away. You can google it to hear her. Oh yes, I know. I mean that I like to hear clips of her reading this piece. Really I love hearing her say or read anything. I have to print this...love it Jackie! Yes...THANK YOU for sharing and for all the support you volunteer and dispense on this site! I absolutely love Maya Angelou. Thanks for sharing her work. Truly inspirational. We can rise above this nicotine. Thanks Jackie for sharing one of her best poems....................a great reminder. She was always—is still—one of my favorite writers and human beings. Her wisdom was hard-won, and she was generous to share it in the beautiful way that only she could. 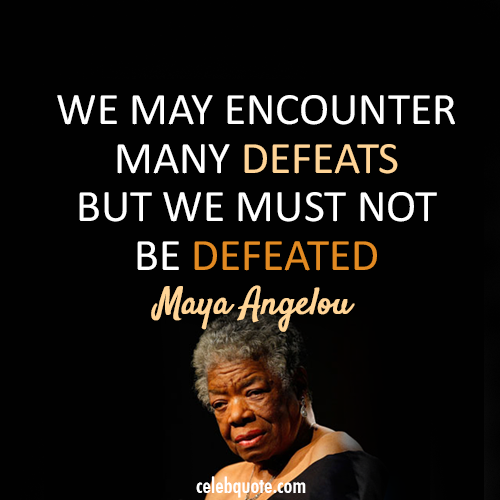 I just love Maya Angelou! She's a class act and a true inspiration. My grandma used to read her poetry when I was a teenager and I fell in love with her inspiring words also. I was fortunate enough to have seen her perform many years ago, and I can still tear up thinking about it. She is/was a national treasure. Thank you for posting this. A national treasure, indeed. Her words speak to so much of our human experience. I was just looking over some post and remembered this one and came back to it to add....Another wonderful woman who I dearly loved, admired and respected was Della Reece. That woman just shined with Gods heart . I miss her. "I could not have made it this far had there not been angels along the way "
" My idea of forgiveness is letting go of resentment that does not serve your better interest , riding yourself of negative thoughts. All they do is make you miserable. Believe me you can fret and fume all you want but whomever it was that wronged you is not suffering in your anguish whatsoever". That is nice, I like that. Check this one out. She was so down to earth and did not pull punches. The Real. Thank you JACKIE1-25-15, that truly was one of her best...there are so many amazing poems that she wrote that ONLY SHE could have written.